The High Country’s beautiful streams, lakes, and rivers provide wildlife sanctuaries and many recreational opportunities- like fishing! The best times of year to fish for trout here in in the High Country are the spring, fall, and winter months, when the water temperature is between 45° and 65°. Our waters offer excellent opportunities for catching brown, brook, and rainbow trout. Many local waters are stocked or hatchery supported, and NC Wildlife management signs are easy to locate waterside. Please be aware that the majority of places you fish around the area require a fishing license. If you need a license, you can check out Village Hardware at 312 Green Street in Blowing Rock, or get one online by visiting ncwildlife.org. Those exempt of requiring a licenses are those who are under age 16 or those who are fishing on their own private property. Below are a few of our favorite public fishing spots in and around Blowing Rock. Continue down the page for more on booking a fishing excursion with local guides! Price Lake is part of the 42,000 acre Julian Price Park. Price Lake is a 47 acre, man-made lake that is stocked once a month with trout. There is also 2.3 mile hiking trail that surrounds the lake, providing multiple fishing spots. The loop is varied, with some paved portions, some gravel, and some narrow dirt. The first 0.7 mile of this trail is level and wheelchair accessible to fishing spots on the lake and Boone Fork Creek. The canoe and boat rental office open May-October, also sells bait and rents fishing tackle. Note that fishing is not permitted from the lake dam or from the footbridge in the Price Lake picnic area. Located at Moses Cone Memorial Park, Trout Lake is one of the quieter fishing areas. The trail around Trout Lake is exactly a mile long with an abundance of wildlife. For fly fishers, be aware that it may be difficult to cast your line due to all the forestry. The parking area for the lake is just off Shulls Mill Road. There are also pull-off parking spaces off Flannery Fork Road to easier access the fishing sections. Trout Lake was built by Moses Cone for- you guessed it- trout fishing! Bass Lake Loop Trail is a 0.8 mile flat hike with easy access- parking is available right off Highway 221 in Blowing Rock. This man-made lake has excellent fishing opportunities for catching trout and bluegill. There are areas open enough for fly fishing, but you’ll want to watch for other people around the trail as it’s heavily used. Boats are not permitted on Bass Lake. Fishing is allowed year-round and only artificial lures are allowed, with a max of 4 fish per day allowed to be kept. The New River is one of the oldest rivers in the world. Both the South Fork and Middle Fork of the New River are hatchery supported trout waters, meaning that there is a seven trout per day limit. Access to these portions of the river can be accessed along the new section of the Middle Fork Greenway near Mystery Hill, and at various points along Highway 321 between Blowing Rock and Boone. Also, several popular spots to cast on the New can be found off Aho Road. Wildcat Lake in Banner Elk is a 13 acre lake that is a great place to cast your line! You can find bluegill, largemouth bass and varieties of trout when you fish at Wildcat. Non-motorized boats, canoes and kayaks are also welcome. Canoe rentals are available at various times of the year. Fishing is open from Dawn to Dusk 7 days a week. This 78.5 mile long river stretches from Western North Carolina to East Tennessee. The portion of Watauga River that is closest to our area is Delayed Harvest Trout Waters. This means that from October 1 to the first Saturday in June, no trout may be harvested or possessed. One of the easiest public accesses for the Watauga River is in Valle Crucis Park, the address listed above. You can also park on the pull-off near the intersection of NC 105 Bridge and Broadstone Road. Several local guides offer unforgettable experiences if a fishing excursion is on your agenda for your next visit. If you want to go with a group, find tucked away hidden trout waters, or if you want to start learning lessons, check out these awesome local places. Chetola Resort offers multiple services for fly fishing. Featuring half and full day trips and even offering lessons. They even have their own Fly Fishing Lodge! 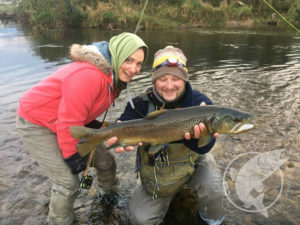 You do not have to be a Chetola guest to book fly fishing trips. You do, however, have to be a guest to use the Sporting Reserve. Offering multiple packages, which include day and overnight packages. Mountains to Coast can provide all equipment and complete instructions that will have you fishing with confidence. Owner, Carl Freeman, is considered one of the top fly fishing anglers and guides in the Blue Ridge Mountains. 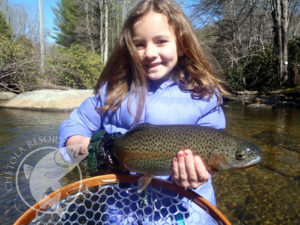 Explore some of the High Country’s premier fishing spots with River Girl! Let Kelly McCoy, founder and fisheries biologist, guide you to some of the best locations our area has to offer. They offer a wide range of services, including fly-fishing lessons, guided fishing trips, and equipment sales. They even offer fly-tying and rod-building classes. 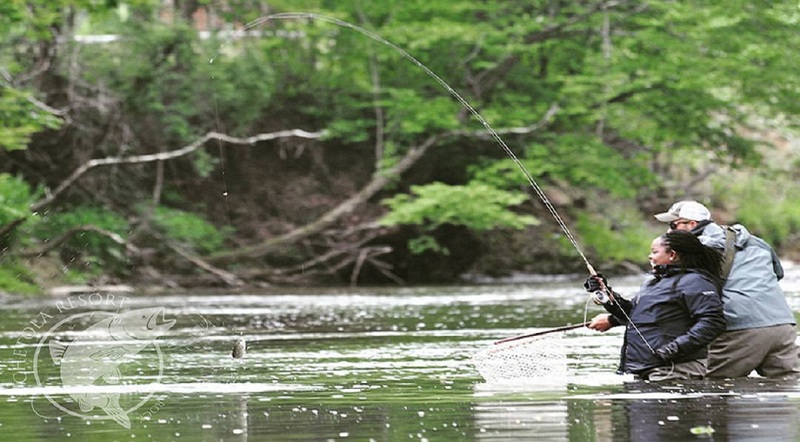 Join a fly fishing excursion with Foscoe Fishing Company. They even have access to the Watauga River out the back door. Explore pristine mountain streams that are located near their shop. The shop is open all year round and have a classroom offering fly fishing schools and fly tying classes. Offering quality trout, smallmouth bass and musky fishing adventures, Elk Creek Outfitters can take you on a trip of a lifetime. Pick from their float or walk/wade trips, or book an overnight excursion. They even offer fly fishing lessons for beginners and advanced fishermen. Half, full, or multi-day lessons available.